A membership program that provides exclusive brewery benefits to club members. Beer served in a glass exclusively made for our Club Members. For the same price as a 13 oz, you get a 16 oz. pour every time you come in! Get an Encore! 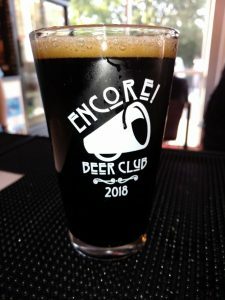 Membership Club 2018 collector’s glass when you sign up! *+1’s must be Married, Significant Others, or direct relations (mother/father, daughter/son). Must buy in at $65 membership initially. Only 1 “+1” per $65 membership.